Oyster mushrooms are so versatile. They are named for their caps, which can fan out to 25 cm (10 inches) and are the shape of an oyster. These mushrooms have a sweet anise aroma and are wonderfully textured. 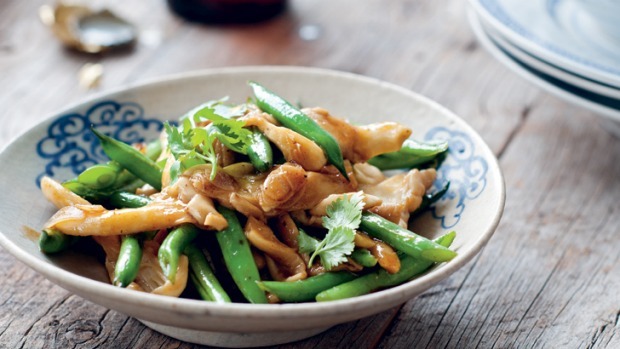 If you want to keep this dish vegetarian, simply use soy or tamari sauce instead of oyster sauce. Heat a large frying pan or wok over high heat. Add the vegetable oil and fry the garlic for 5–10 seconds, or until fragrant. Add the beans and stir-fry for 2 minutes, then add the mushrooms, soy sauce, oyster sauce, sugar, sesame oil and pepper. Toss for a further minute. Transfer to a plate, garnish with coriander and serve. I cooked this dish in the garden of one of Hoi An's most beautiful restaurants, called Brother's Cafe. Built by the French in the early 1900s, it has the most spectacular landscaped garden along the river. Be sure to get a table outside in the evening to enjoy the view. The chefs there were easily able to source fresh young coconuts for me, but if you have to use tinned young coconut juice, omit the sugar in the recipe as tinned coconut juice contains added sugar. In a mixing bowl, combine the fish sauce and sugar and mix until the sugar has dissolved. Add half the lemongrass, half the garlic, half the chilli and all of the chicken. Toss the chicken to coat, then cover and marinate in the refrigerator for 1 hour, or overnight for an even tastier result. Heat a large saucepan or wok over medium heat. Add the oil and the remaining lemongrass, garlic and chilli and stir-fry for 1 minute, or until fragrant and slightly brown. Increase the heat to high, then add the chicken and seal for 2 minutes on each side, or until browned all over. Now add the coconut juice and onion. Cover and cook over medium heat for 5 minutes, or until the sauce has reduced by half. Transfer to a bowl, garnish with coriander and serve with steamed jasmine rice.